Key Difference: Dental floss is made of single strand or different strands of materials like nylon, rubber, plastic, etc. It is used for removing food particles and plaque between the teeth. Dental tapes are thicker in comparison to conventional types of floss, and are generally used for widely spaced teeth. 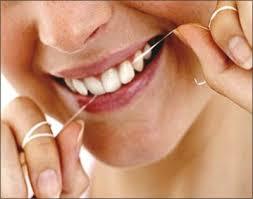 Dental floss is regarded to be an efficient cleaning aid for teeth health care. It is basically a thin and soft thread which is made from material like nylon or plastic. It helps in removing food and plaque which tends to reside between the teeth. There are numerous types of floss available in the market. Ribbon floss is preferred for sensitive gums and teeth. Automatic flossers are also available for those who find it difficult flossing. One just needs to hold the floss tightly and guide it to between the teeth by using a gentle sawing motion. A gentle scraping at the side of the tooth helps in cleaning. It is generally wrapped around the teeth, than an up and down motion is followed for removing plaque. A Dental tape can be referred to as just a wider form of dental floss. It is more flattened and wider than a usual normal dental floss. It is used on the interproximal surfaces of the teeth. One must be careful not to ruin or damage the interdental papilla while using the dental tape. A dental tape works the same way as a floss works. The main difference remains to be the thickness of dental tape which is essentially thicker than a dental floss. Dental tape is more suitable to be used for those teeth which are spaced far apart. Due to its wide edges, it is able to reach between larger gaps. It can therefore be used on young children who have some missing teeth or for arthritis patients who are not comfortable using a regular floss. Dental tapes are thicker in comparison to conventional types of floss, and are generally used for widely spaced teeth.